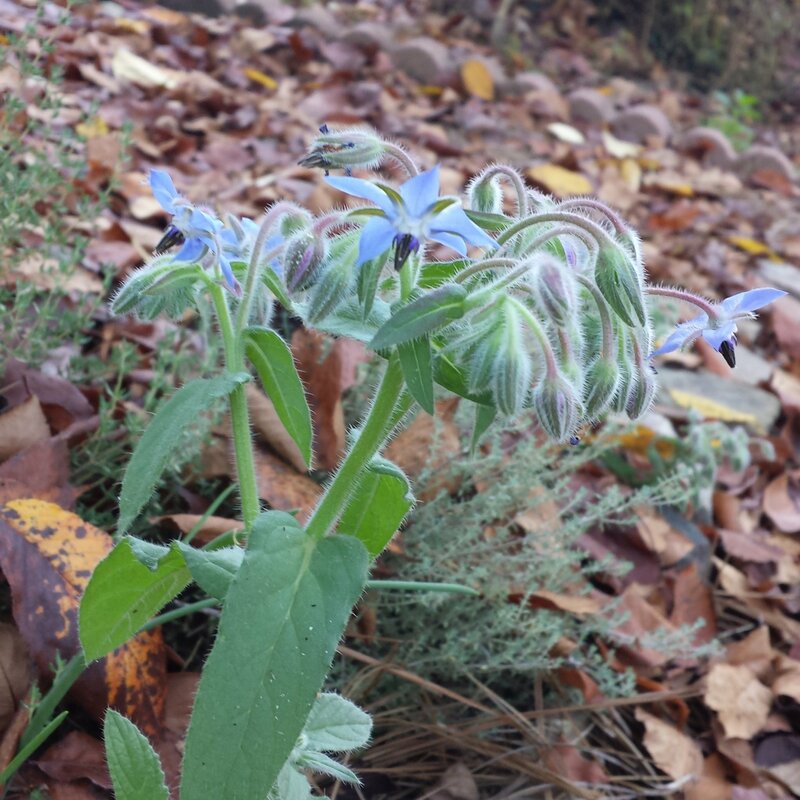 Above: Borage that reseeded from spring. I’m on the front porch, attempting to blog from my Kindle, which is not always a good platform. A lot of times I will write the post, schedule it for later, check it on my big screen at work, then release it. Since I’m home for a few days more, I’ll be less picky. My gallbladder was removed on Thursday morning, a procedure which I was never fully convinced that was necessary, but after seeing the ultrasound I went with the surgeon’s advice. Fortunately I only had a couple of attacks this summer and they weren’t as bad as my husband’s attacks seemed to be, but bad enough. It was full of “sludge” and wasn’t going to get better so now it’s been fired and marched out of the building. I had been told there would be two incisions, but right before the surgery the wording had been changed from laparoscopic to minimally invasive and I have three inch-long incisions in my abdomen area and one small one at my navel. I signed off on it because he had also told me beforehand that he would change if necessary. I plan to ask him why it was necessary. The level of pain afterwards surprised me. Hydrocodone has not been very effective for me in the past and I was on oxycodone after my last surgery. I didn’t consider talking to the surgeon about that before the surgery. Fortunately the nurse gave me an oxycodone in the recovery room and that helped for a couple of hours. I had surgery and was sent home before noon! That was different from Sandy’s surgery in 2006, when he was in a hospital room until about 9:30 that night. By the time I realized that the hydrocodone was not going to control my pain, it was after office hours and I decided I could stick it out overnight. Sandy stayed home for another day and picked up a new prescription around noon. Now I have been able to sleep and although I am not painfree it is much more tolerable. My dreams have been fun and I have played with Lucille Ball and Jerry Seinfeld and Elaine Benis. This is quite different from my ordinary dreams which usually involve moving a lot of stuff from one place to another. Now I just finished a little pot of coffee and Sandy is making pancakes. Today should be a much better day. Will post again later, since I hope to do some work on my books for the Triangle Book Arts group show, and maybe some tapestry weaving. Yikes! I hope you’re feeling better by now!